The name, "Ninu Nina" stems from the alien language spoken by Robin Williams in "Mork & Mindy" ( a popular 1970's comedy show). Laurent King grew up in Paris, and went to American University where he focused on what he had always wanted to do: film studies. One of the strong points of AU was its exchange program with the National Film School in Prague, Czech Republic. He spent a semester there in 95, ( I decided to go the year after) where he directed his first serious short film (not counting the many and somewhat shameful home video attempts of the past 6 or 7 years). When he saw all that could be done there it became his mission to go back. Once he returned he made a film which ran 1 hour 1 minute in its worst version, we don't know if that technically qualifies as a feature! Once he settled back in Paris, he worked at a youth center in a semi "difficult" part of town, which he felt was a good way to step back into French culture after a college hiatus of 5 years. Things had changed. Then in 2000 military service ended and he ended up on his own work wise. "Nobody ever teaches you how to build a network, or what to do once you step out of school. You may know things, but what makes you different from the next guy or how do you put your foot in the door: where do you start?" So he worked on all kinds of projects, documentaries, fictions, and was director of photography for small TV Projects or re-shoots. Then in 2002 he directed a music video for Universal Music, then hopped along from project to project. 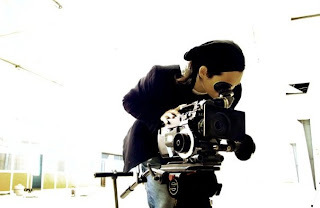 Things structured, and he began to split his work between director and DOP and is now repped as director for commercials in France (Bandits, Bollywood), UK (Upstart Films) and Belgium (Latcho Drom). I love Laurent's work. Two of my favorite being the video he directed for girlfriend Charlotte Savary of Waxtailor, To Dry Up and Hey for the group Clover she was in before( one of my favorite tunes). There was a time when Brian De Palma's work really touched me in its operatic grandeur, so The Untouchables and Carlito's Way are up there, I saw them many times. Then there's "Soy Cuba" a Russian black and white film which I re-discovered on a film print at the French Cinematheque. A lot of these shots are incredible, probably the best use of handheld cameras with wide angle lenses ever, to this day I am still uncertain as to how they achieved technically speaking, some of the shots. The older I get the more I appreciate Kubrick. And I like Mark Romanek. Photography is more here and there, I like the colors of Jan Saudek, the framing of Guy Bourdin, the emotions out of Robert Franck or Leonard Freed, but my attraction to photography is more on an individual picture basis than a particular artist's body of work. Favorite musicians? Tough question because there are so many. Judging by the play count on my iTunes Library I guess The Album Leaf, Low, Sigur Ros, Portishead and of course... Wax Tailor. They all have in common the fact that they bring up images to my mind. How NY has inspired your work? I've been to NY many times and what I like about it is the spirit. It ties everybody together, even though New Yorkers come from all over the world, but once you catch that fast train that is the New York City pace, everything is possible. I've always felt that, even though I've always been there as a "tourist" and have never lived there. I mainly use functional websites, but I often go back to Apartment Therapy because I'm obsessed with small spaces, inhabitat for the green in me, engadget cause I love gadgets and those usually get me bouncing around to the web sites they refer to. Future projects you would like to pursue? Slowly I'd like to move towards the feature film genre, but not until I have a good story. Since so far I'm working on that alone, it could take a while, but I'm in no hurry. I could live with doing one feature albeit a good one, instead of pumping out 1 average every year. Brian De Palma for the grandiose David Cronenberg for the organic, Ridley scott for the smoke machine. I wish I could sound smarter and whip out Abel Gance and Jean Renoir or Tati, but I have been brought up with modern classics. I noticed architecture plays an important role in your visuals? Architecture is more an excuse to play with lines when composing a frame. It's more about the geometry of what you put in the picture rather than a true focus on architecture.